Humanity’s advances to date have been accompanied by great leaps in the density, diversity, and virtuality of our societies, and in the miniaturization and efficiency of our technologies. Among these and other variables determining social progress, two stand out as particularly special. The more our intelligence gains access to “Inner Space,” both to the domain of very small size scales, or “Physical Inner Space”, and to the domain of very powerful brain-based and computer-based simulations, or “Virtual Inner Space”, the faster we learn to generate major new economic, social, and adaptation benefits for civilization. This “Race to Inner Space” may turn out to be the dominant developmental trend for our species. 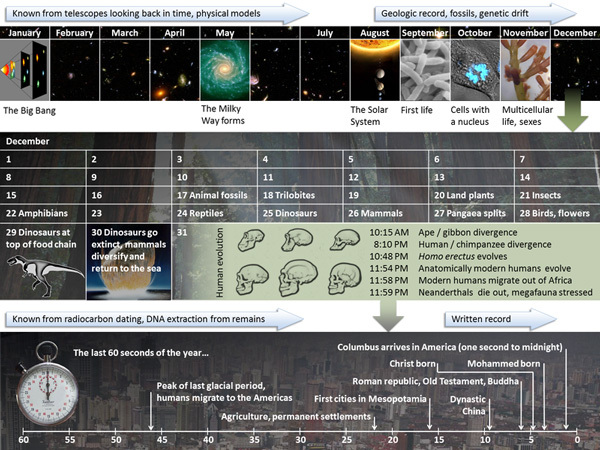 The Cosmic Calendar: 13.7 Billion Years of Universal History Depicted Over A Cosmic “Year”. Lovely creative commons image by Wikipedia author Eric Fisk. As Carl Sagan famously argued in the Cosmic Calendar metaphor of Big History, life on Earth has been engaged in a continual acceleration of structural and functional complexity emergence since its birth 3.8 billion years ago. At the same time, each newly emergent complex system, from stars to cities, from prokaryotes to computers, uses vastly smaller quantities universal space, time, energy, and matter or STEM, per novel information production, computation, or physical transformation, than the system that came before it. We may call this phenomenon STEM efficiency and density increase, or STEM compression, and we can see and measure it in spatial, temporal, energetic, and material terms. Over time, the leading edge systems use ever less of the resources of “Outer Space” to generate ever more novelty, intelligence, and capability in “Inner Space”, an exciting and apparently universal process. If this astonishing trend continues, our and other universal civilizations may eventually reach black hole level computational efficiency and density and transcend our universe, a topic I’ve speculated on in the Transcension hypothesis. Certainly humanity’s ability to think, act, and shape our world has grown ever faster, more powerful, and more novel since Australopithecus garhi, perhaps our earliest tool-using ancestors, fashioned the first stone tools more than 2.6 million years ago. We are also much more densely associated in our cities, and engaged in far more virtual activity than our ancestors. Since the advent of currency circa 5,000 years ago, human wealth production has also become an increasingly instantaneous and virtual economic process, today involving trillions of dollars in daily foreign exchange and billions in program trading. Though modern economies experience occasional recessions, these grow rapidly shorter with time, and even the worst now last less than one decade, just one seventh the typical human lifespan. Surprisingly, these periodic slowdowns are not even visible on long timescales. 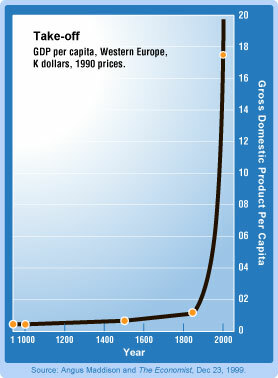 The curve to the left, charting GDP per capita in Western Europe from 1000-1999 AD, with data compiled by economist Angus Maddison, shows that global wealth production now grows almost instantaneously fast over the span of a century. Reporting on this in The Economist in 1999, the authors said it “looks less like an inevitable process and more like a single, astonishing event.” In my opinion, this acceleration, just one of several special Inner Space trends in human civilization, clearly does look like it might be an inevitable process, and it is precisely this parochial attitude, this failure of vision and lack of willingness to ask unpopular questions about value creation and technological change, that keeps today’s media from seeing and reporting on accelerating complexity development, and that keeps today’s economic theory ignorant of the inevitable accelerating benefits that come from our investments and actions in Inner Space. At the same time, as Kevin Kelly notes in What Technology Wants, 2011, the redundancy of our technology and its distributed knowledge systems protects this accelerating planetary process of wealth and knowledge creation better than ever before. While individual nations, regions, companies, and individuals regularly suffer slowdowns and catastrophes, our global system, like an organism with a developing brain and immune system, rebounds from damage faster, stronger and better the more complex it gets. The story of our accelerating resiliency to complexity disruption, however, is even more ignored, ridiculed, and unaccepted today than the story of accelerating change. We need to fix this state of affairs. The longer we ignore planetary processes of collective intelligence and immunity development, the longer our political, economic, technological, and social policies remain unenlightened, ineffective, and focused on the wrong goals. The longer we wait to study these processes with the rigor they deserve, the longer we remain burdened with preventable suffering, living in the flatlands below the knee of the next growth curve of capacity building, intelligence advancement, and wealth creation. I believe that humanity’s collective intelligence, wealth, and resilience have accelerated for so long because, via STEM compression, we have continually learned how to move our intelligence into ever smaller domains of nanotechnology, or Physical Inner Space, thus escaping resource limits, while at the same time, developing ever smarter simulations, or Virtual Inner Space, so we can “think more” and “act less” in the search for new capabilities and wealth-creating innovations. Today, a growing proportion of our leading innovations happen either at very small scales in physical, chemical, or biotechnological processes, or inside computers and their networks and software. It is only these special systems that use less and less physical resources to produce more and more social value, a process that the futurist Buckminster Fuller called “ephemeralization,” or doing more and more physical transformation (“acting”) and simulation (“thinking”) with less and less space, time, energy, and matter, or STEM. 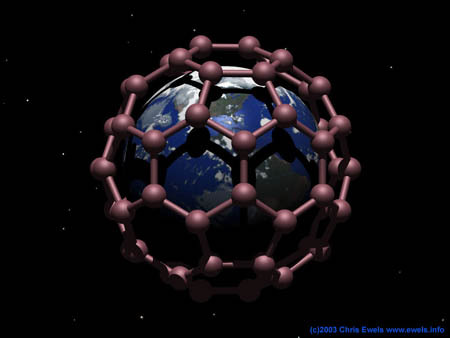 In a very real sense, we are “moving the world” to Inner Space at an accelerating pace, as depicted in the fullerene (“buckyball”) molecule enclosing Earth in the pretty picture to the right by nanoscientist Chris Ewels. In humanity’s great race to Inner Space, we are on the edge of major new breakthroughs in nanotechnology engineering, and of the web becoming a metaverse, the most intelligent and valuable natural environment on the planet. We may soon see such infotech and machine intelligence advances as a conversational interface (a web that understands us when we talk to it), digital twins (aka “smart agents”, semi-intelligent avatars that can model and represent us), a valuecosm (quantified maps of all our values and goals), and statistical measures of our individual and social progress. These seem likely to be very empowering and democratizing innovations. These same nanotechnologies and information technologies offer all the leading solutions to today’s greatest global challenges, including cheap energy and CO2 reduction (nanosolar, which doubles global installed base every two years, and halves its cost every ten years, engineered algal biofuels, which for some applications are now the same cost as oil, fuel cells, etc), food (a genetic green revolution), water (nanodesalination, which doubles global installed base every six years, and halves its cost every nine years), reducing poverty, overpopulation, and slums (smart internet, internet TV, online education, science and technology education, entrepreneurship, women’s and civil rights, green cities), reducing crime and terrorism (global transparency and sousveillance) and bioterrorism (immune system aids like DRACO), and building trustable machine intelligences and robots (we may evolve our machines to be trustable, just as we have bred domestic animals to be trustable, without “designing” them). Even human death is in the process of being challenged. For those who die today, one path to further life may be chemical brain preservation at death, followed later by advanced and inexpensive nano and information technology. Every major human problem we see today has one or more Inner Space technical solutions on the horizon. How do we help more of our leading countries, institutions, corporations, and entrepreneurs to understand and benefit from our civilization’s apparently inevitable race to Inner Space? How do we get this realization to become part of the story of Big History, told to all curious children who seek to understand the universe? As the pace of life speeds up, many people and organizations react with fear and fundamentalism to accelerating change. How do we help them instead to embrace the most humanizing technologies, and to develop a continual learning and evidence-based culture? For how much longer will our political and corporate leaders continue to severely underfund global nanotech? The world’s governments spend just $10B/yr annually on nanotech R&D funding, with the US spending just $2.2B annually, primarily via the National Nanotechnology Initiative. This is just 0.3% (0.003) of our $740B defense budget in 2010. Just 0.06% (0.0006) of our $3.5T in federal spending. Since 2011, China now spends more on nanotech R&D than the US, with just one fifth our GDP. This positions them to start far more of the nanotech jobs of the future. We should be competing much more on that front. We also seriously underfund global infotech. The US spends almost all of its unclassified investments in infotech R&D through the Networking and Information Technology Research and Development (NITRD) Program. As of 2007, NITRD spending was just $3B/year. You can bet it hasn’t gone up since then, given our recent economic woes. How long until we change our priorities? How many great nano and infotech solutions to our present global problems are we presently ignoring, instead wasting most of our precious time, intelligence, and energy on far slower, cruder, and less inefficient “Outer Space” technologies and strategies? I suspect every nation on Earth, and many companies, spend a good deal less on nanotechnology and information technology education, research, development, strategy, and entrepreneurship than they should, given the continually accelerating returns delivered by these special technologies. I know that nations and companies rarely have good forecasts of accelerating returns in Inner Space to guide their policy, or to time their product development strategy, because I’ve been a scholar this field for ten years now. The world, by and large, is not yet awake to this trend. We are all running a race, but most of us are not yet conscious of it. That needs to change. Fortunately, some nations, regions, and companies do a much better job promoting technological progress than others. Some prioritize science and technology policy, education, research and development, innovation, and foresight. Some encourage competitions and give scholarships and hiring priority to the most technically proficient, innovative, and entrepreneurial. But few nations give sufficient access to credit and other startup resources for their best technology entrepreneurs, or create fair competition environments to allow both large and small businesses to create new technology products and services. As citizens, we often don’t measure and rank our local, state, and national politicians for their science, technology, innovation, and entrepreneurship credentials, and reward them with our votes. As consumers, we don’t always look for, rate, and buy the smartest and most resource-efficient products and services, as soon as they become available. I believe the best way to improve the world is to recognize where it is going, to Inner Space, and to see the powerful role that each of us can play in building a much faster, smaller, smarter, and wealthier future for all of us.